The city of Lacey, Washington was home to Yerasyl Toleugazimov-a 2011-2012 Future Leaders Exchange (FLEX) program participant. Yerasyl, a citizen of Kazakhstan, spent his junior year of high school in Lacey and summarized his experience saying, "I learned new things that changed me." "Because I was a student ambassador, lots of students were interested in knowing about my country," says Yerasyl. "I wore cultural clothing and did presentations in order to share my culture." "I was required to do 20 hours of community service and I did over 100 hours. I worked at the Salvation Army in the community kitchen and fed homeless people. In Kazakhstan it is not that common for people to volunteer so it was a new experience for me." Yerasyl loved the American school system. He was able to take swimming, tennis, and soccer—extracurricular activities that are very expensive in his home country. More importantly, Yerasyl noticed how students from all walks of life interacted with one another. "I noticed in America that disabled students were studying side-by-side with other students," says Yerasyl. "It is not like that in Kazakhstan, so disabled students don't get to interact." "Disabled people were always in those positions but I never thought about it. When I came back to my home I joined the online community in Kazakhstan. One project that we have done is recording the conditions of the facilities of the disabled people and posting it on social media." 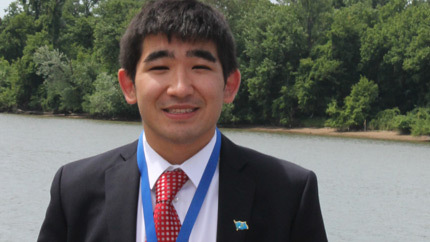 "Since I returned I am doing an internship with the NGO Eurasia Foundation of Central Asia. I am working on social issues and helping with unemployment among youth." "This experience totally changed my opinion about different things in life. When I came here I realized that things can be better and that I can make a difference. We all can work together and make a difference."